The Tennessee State Fair is a celebration of rural life. 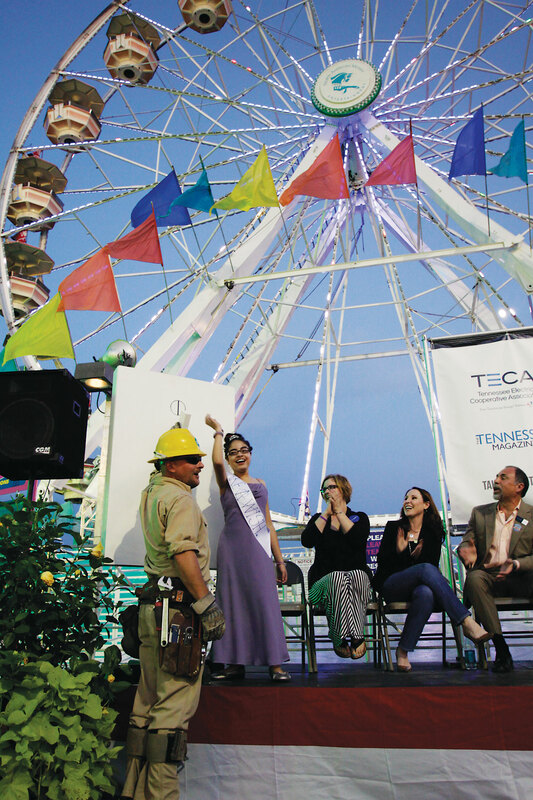 Last month, Tennessee’s electric cooperatives had the opportunity to help flip the switch and “light the midway” during the fair’s opening ceremony. It was only fitting that rural electric cooperatives were on hand to turn on the lights. It was a perfect representation of what more than 2,600 electric co-op employees do each day across the state. The power they provide does more than chase away darkness — it powers the technology and innovation that connect us, it creates opportunity for jobs and commerce and it ensures the safety, comfort and convenience we often take for granted. “Princess” Zoe Redington and Gibson EMC lineman John Spence flip the switch to light the midway at the 2014 Tennessee State Fair. Looking on are, from left, Zoe’s mom, Heather Redington, Beth Torres with Make-A-Wish Middle Tennessee and David Callis with the Tennessee Electric Cooperative Association. A lot goes on behind the scenes to get power to your home. There are people like John Spence, the Gibson EMC lineman who helped turn on the switch at the state fair. There are engineers, member service representatives, foresters and communicators who work together to make a very complex job look easy. Success for them means the lights come on when you flip the switch and your bill is affordable when it arrives in your mailbox. It’s challenging work, but we know that low-cost, reliable electricity is critical for our rural and suburban communities. You can learn more about our continuing efforts to keep power affordable and reliable on page 6. During the fair’s opening ceremony, we had a chance to meet wish ambassador Zoe Redington, a young lady struggling with a serious medical condition. Make-A-Wish Middle Tennessee granted her wish to go to Disneyland earlier this year. Zoe embodied the princesses she met at Disneyland by wearing her tiara and sharing her wish experience. I encourage you to learn more about Make-A-Wish Middle Tennessee’s work at middletennessee.wish.org. The rural roots we celebrated at the Tennessee State Fair are a part of our DNA as electric cooperatives. In the 1930s, when no one else would do it, farmers and rural residents built the grids that electrified the countryside, building the cooperative model that still powers much of Tennessee. That self-sufficient character of rural residents is something you can’t really explain; you have to experience it.